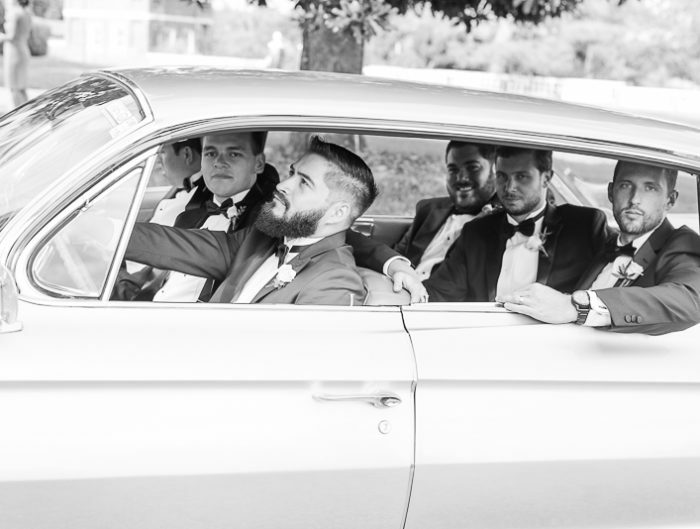 Welcome back to today’s rockstar, music-lovin’ wedding in Virginia! 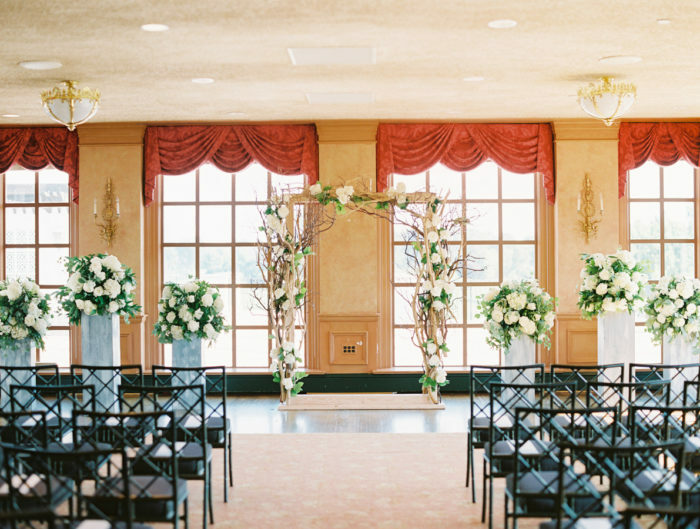 Mai-Lan and Bill opted for a close-to-home wedding ceremony and reception at the beautiful C‹larendon Ballroom in Arlington, where they infused a gothic design into their wedding day. In case you missed their stunning wedding ceremony (and all of Mai-Lan’s red wedding dress! ), be sure to check it out here. After their weddding ceremony, the ballroom was flipped in a wedding reception filled with music and dance (the groom is in a cover band!) and even the bride got up to sing a tune or two! The personal touches were everywhere during their wedding, including 1,300 cranes folded by the bride! The handmade cranes strung about the ballroom, bring not only a decor element to life, but good luck too. The couple also shared favorite movie quotes throughout their wedding and opted for a less formal wedding meal service so that the emphasis would be on connecting, sharing, and of course, dancing – love that! Thanks to Nat Wongsaroj Photography for capturing Mai-Lan and Bill’s rockstar inspired wedding so beautifully and sharing it with us! From the bride: Music has been a huge part of our lives, so we wanted a wedding with a rockstar, gothic-­inspired vibe. My wedding dress was red, so that helped define the color palette for our wedding! We picked shades of red, charcoal, and black for our wedding palette and added pops of gold and silver for accent colors. We opted for a cocktail ­style wedding reception with small plates and carted hors d’oeuvres. For seating, we went with a mix of high tops and 5′ round tables, since we wanted to encourage our wedding guests to mingle. For the wedding party and family, we placed a 30′ kings table in the middle of the wedding reception area and we lined it with ornate piano black pillar candle holders and lush arrangements of burgundy and deep red florals. We put personal touches wherever we could at our wedding. I folded over 1,000 origami cranes (1,300 actually!) as a personal nod to a childhood hobby, and also because I thought the effect would be really cool. They were strung over the bar area and individually placed in random places throughout the wedding venue. Legend has it that folding that many cranes also brings eternal luck and good fortune, so that’s also a plus! Being avid movie and TV watchers, we framed quirky, favorite quotes and placed them on each of the tables and high tops. I also designed our wedding programs and hand painted our wedding cake toppers. After dinner and toasts, my husband and his cover band, Over the Line, took to the stage and performed a full set before DJ Jaime played out the the rest of the night. I even sang a song with the band! It was so fun to see our close friends and family rocking out together and to get the opportunity to perform at such a fun venue! It’s so easy to get caught up in the minutiae when planning a wedding, especially when you’re as detail oriented as me. Don’t sweat the small stuff! 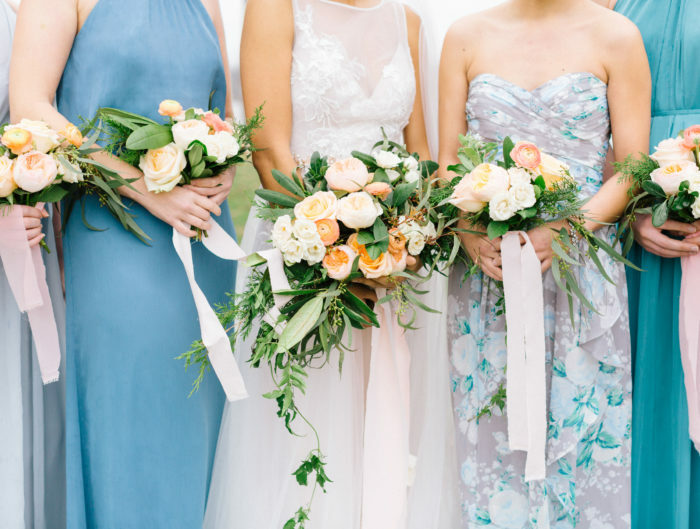 Make sure you both agree on a wedding budget from the start that’s realistic and achievable, but know that you may need to be flexible and willing to compromise along the way. Prioritize what is important to you! I’m still amazed at how expensive weddings can be and it’s so easy to get swept up in the details. Having a wedding planner and leaning on close friends and family really helped us maintain our sanity throughout the process. Lastly, I highly recommend considering a first look if you aren’t traditional when it comes to seeing the each other before the ceremony. It not only helped to calm the nerves, but also allowed us to have a few private moments to really soak in seeing each other for the first time. We hired a stretch limo to take us and our wedding party into Georgetown for group photos. It was really fun to get a quick photo session with our bridesmaids and groomsmen before heading over to the wedding venue. It also gave us a chance to hang out with our guests during the cocktail hour since we’d already taken our group photos earlier in the day. I love that our wedding photos were taken in multiple locations over the course of the day and night and therefore had such a variety of scenery, tone, and lighting. Congratulations to Mai-Lan and Bill! Thank you for sharing your wonderful dance party, we mean wedding reception with us!